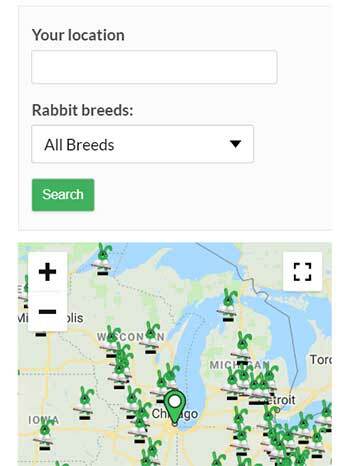 Learn more about American Sable Rabbits! American Sable rabbits are unmistakable due to their unique color patterns. They highly resemble a Siamese cat. 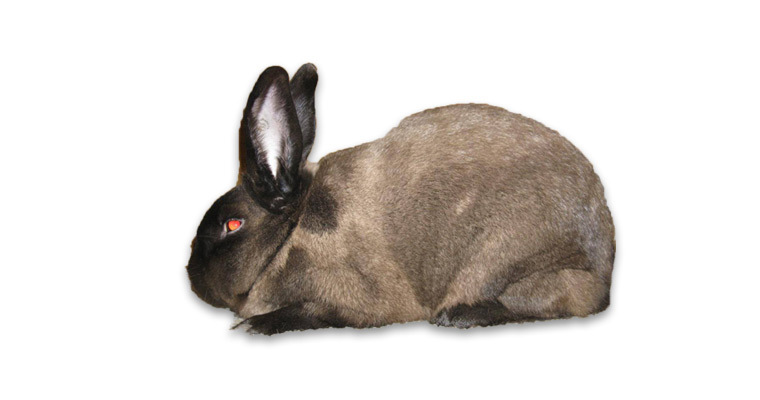 American Sable’s were created by crossing various types of Chinchilla Rabbits, producing an entirely new color, while their body remains true to the Chinchilla breed itself. Even though Sable’s first began appearing in the early 20th century, developed by Otto Brock from California, and were accepted as a breed by the ARBA in 1929, they began losing their appeal. By 1981, only one rabbit was presented at the ARBA Convention. However, one short year later, with the dedication of Al Roerdanz, from Ohio, boosted the revival of the breed and that resulted in the future continuation of the breed. What is an American Sable? American Sable’s are medium sized rabbits which are a sepia brown colored body, and darker sepia (black-ish) facial-flanks, ears, feet, back, and tail. They have a fine, thin type of fur, but due to its density, they require a lot of grooming; especially while molting. Additionally, this breed comes in two basic colors – a medium shaded Sable and the lighter Siamese Sable. As breedings of these colors continued, a Tan-pattern (marten) Sable also started appearing. Rather than including that as an American Sable rabbit though, they were accepted as a new variety of the Silver Marten breed of rabbits. They are commonly known to be social and friendly to people and other rabbits and animals, and they greatly enjoy playing with toys. American Sable’s tend to make wonderful pets, especially for pet-owner’s who enjoy energized animals. How do I care for an American Sable? American Sables do not require any excessive care than what most other breeds require, although grooming should never be over-looked. Since they are a medium sized rabbit, care would be to be used when choosing a home for your new pal. 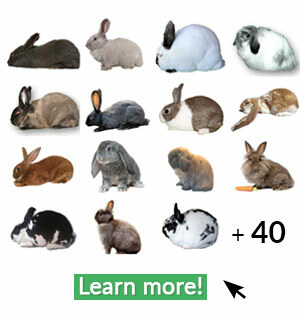 The general rule of thumb, for any rabbit, is to allow for the bunny to have no less than 3-4 good-sized hops to reach from one end of his cage to the other, and the same or more in cage width. We recommend nothing smaller than a 36×36 sized pen. In regards to diets for a Sable, the same applies for this breed as is for most any other breeds: top quality pellets, lots of fresh water, hay, romaine lettuce and other rabbit-safe veggies, and allowances of a few pieces of fruit once in a while as a treat is always a way to earn some extra bunny-kisses. 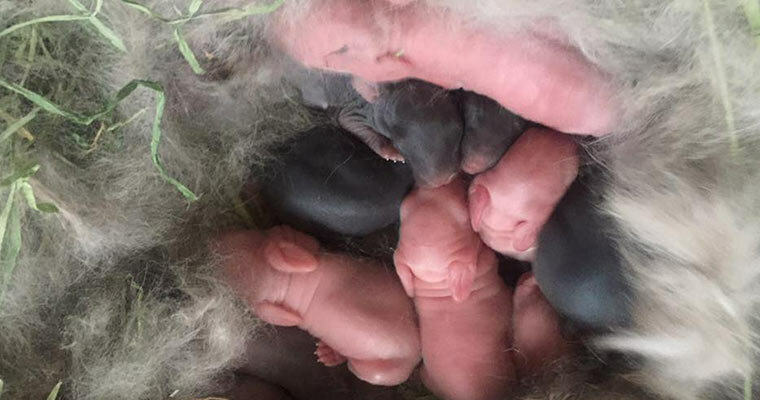 Litter of American Sable Rabbits! Is my American Sable show quality? American Sables are classified as having a commercial type body. This is due to their size and typical weight, which for mature aged bucks are about 8lbs and does are about 9lbs. Their colors range from dark to light sepia shading, which judges are to award or deduct points for. The desired traits are for the head to be rounded with erect ears, followed by a smoothly transitioning top-line that begins at the base of the neck, over the midsection, and down to the tail. 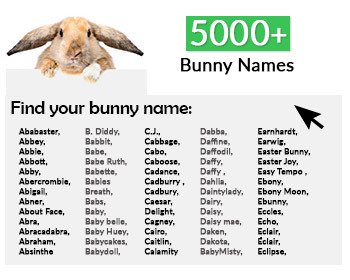 When posed, these rabbits should display a cobby body which is well-muscled, covered in a soft, fine rollback coat. Additionally, their eyes much carry a ruby hue to avoid disqualification during showing. SHOW POINTS: Sables are judged most heavily on correctness of colour, then type, weight, and fur, followed by condition, which allows for a possible 100 points.